VOA: Can you tell me about Zyrorobotics? Howard: Yes, so Zyrorobotics is about making STEM accessible to all children. And so what we do is that we develop tools, most of them free online, that students can use to learn how to code, to get better at math and science. VOA: Can you tell me briefly the connection between you and NASA? Howard: So I worked for NASA for about 10 years and my position was to think about future Mars exhibitions and how to make them smarter so that we can navigate further, we can explore interesting places without requiring scientists or mission control intervention all the time. So it’s really to figure out how to make Rovers smarter. VOA: What are you bringing to the table for the Cambodian students here? Howard: So my goal is to show students that STEM and robotics is the next generation and hope to engage students so that they can see the value that they would have—being in Cambodia that the world needs students to really make sure that our world is a better place. VOA: What are your hopes and expectations for the Cambodian students? 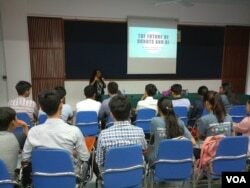 VOA: What do you think of the progress of the Cambodian students in the context of the STEM? Howard: I would say I have been very, very impressed with the quality of the students, their excitement about the STEM field, of their kind of questions and their curiosity about the next generation of robotics systems. 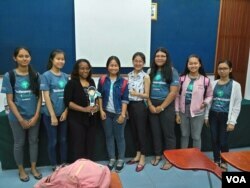 I’m very impressed with respect to their background and the experiences they have already had and, in some cases, pushing forward the stem initiative. VOA: Are there any areas that you see need improvement? Howard: So the only area I see needing improvement is just exposure to all of the resources that are out there. There are a ton of resources that are out there that students maybe haven’t been exposed to, and that they can have access to. VOA: How far do you think Cambodia is in terms of the STEM? VOA: What role do you think the government or the private sector should play in this context? Howard: I think that you can provide aspects such as seed funding. You can provide things that provide scaffolding if you’re a young entrepreneur starting a business. You need resources. You need space. You need to figure out how to raise money for your first year. I think those are things that the States have done with a start-up culture I think that Cambodia can do that as well. VOA: Back in the context of the public, what do you think the public should know about STEM? Howard: I think the public should know and realize that STEM is the future. It can take someone who is in a rural area and bring them to being in a middle-class economy. I think that STEM is a playing field. A level playing field. It is the equalizer because it’s all about the mind and just learning one step at a time. VOA: What is your take on the innovation and creativity here? Howard: So the innovation and the creativity here in Cambodia links to the young folks that I’m so impressed with. They seem to get the fact that engineering is about being creative. It’s about figuring out new solutions to old problems and so I do not doubt that the young people will become engineers and solve some of the problems that exist in society. VOA: Any advice for the younger generation? Howard: So the one piece of advice I would give is, just do it. There are resources out there... online, that are available, and just have the confidence to push forward and really embrace this whole STEM world. I really do encourage the younger generation to continue and pursue that. Perhaps even teach the older generation how important it is.